Once applied you will feel it work immediately binding to your hands giving you the grip you need for any application. Leaving no messy residue, or harmful dust! A small application is enough to last through the toughest, sweatiest, training session. 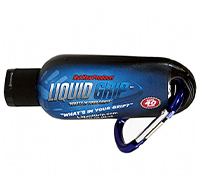 Feel Liquid Grip activate as your hands become sweaty creating an invisible grip like no other. Unlike regular chalk, Liquid Grip binds to your hands giving you a long lasting grip for any application with no messy residue or harmful dust. This slim easy to use bottle will last over 30 applications when used as directed and includes its own Carabiner so it’s simple to take along with you no matter where you are.